My name is Dov Weiss, and I was one of a group of about thirty young men who started the moshav (agricultural settlement) of Komemiyut, in the south of Israel. It was in 1950, after we had completed our army service. I was still a bachelor then. Among the founders was also the well-known Torah scholar and rabbinical authority, Rabbi Binyamin Mendelson, of blessed memory. He had previously immigrated to Israel from Poland, and had served as the rabbi of Kfar Ata. At first we lived in tents, in the middle of a barren wilderness. The nearest settlements to ours were several kibbutzim associated with the left-wing Hashomer Hatzair movement: Gat, Gilon and Negba. Several of our members supported themselves by working at Kibbutz Gat, the closest to us, doing different types of manual labor. 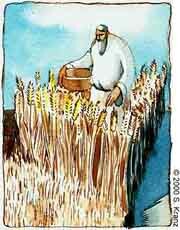 Others worked in our fields, planting wheat, barley, rye, and other grains and legumes. I myself drove a tractor. Our produce, which grew throughout the 15,000 or so dunams (nearly 4000 acres) allotted us, we sold to bakeries and factories. At that time, there were not yet water pipes reaching our moshav. We had to content ourselves with what could be grown in dry, rugged fields. Every few days we would make a trip to Kibbutz Negba, about 20 kilometers distant, to fill large containers with drinking water. The second year we were there, 5712 on the Jewish calendar (1951–52), was the Shemittah year, which comes every seventh year, in which the Torah commands to desist from all agricultural work. We were among the very few settlements in Israel at the time to observe the laws of the Sabbatical year and refrain from working the land. Instead we concentrated on building, and succeeded that year in completing much of the permanent housing. The moshav gradually developed and expanded, and more and more families moved in, as well as a number of young singles. By the end of the year we numbered around eighty people. As the Sabbatical year drew to its completion, we prepared to renew our farming activities. For this we required seed to sow crops, but for this purpose we could use only wheat from the sixth year, the year that preceded the Shemittah, for the produce of the seventh year is forbidden for this type of use. We went around to all the agricultural settlements in the area, near and far, seeking good quality seed from the previous years’ harvest, but no one could fulfill our request. All we were able to find was some old wormy seed that, for reasons that were never made clear to us, was lying around in a storage shed in Kibbutz Gat. No farmer in his right mind anywhere in the world would consider using such poor quality seed to plant with, not if he expected to see any crops from it. The kibbutzniks at Gat all burst into loud derisive laughter when we revealed that we were actually interested in this infested grain that had been rotting away for a few years in some dark, murky corner. “If you really want it, you can take all that you like, and for free, with our compliments,” they offered in amusement. In any case, we didn’t have an alternative. So we loaded all the old infested seed that the kibbutz had offered to us free of charge onto a tractor, and returned to Komemiyut. The laws of Shemittah forbade us to plow and turn over the soil till after Rosh Hashanah, the beginning of the eighth year, so we didn’t actually sow the seed until sometime in November. This was two or three months after all the other farmers had already completed their planting. That year, the rains were late in coming. The farmers from all the kibbutzim and moshavot gazed upward longingly for the first rain. They began to feel desperate, but the heavens were unresponsive, remaining breathlessly still and blue. Finally it rained. When? The day after we completed planting our thousand dunams of wheat fields with those wormy seeds, the sky opened up and the rains exploded down to saturate the parched earth. The following days we were nervous in anticipation, but we turned our attention to strengthening our faith and trust in G‑d. Anyway, it did not take a long time for the hand of the Almighty to be revealed clearly to all. Those wheat fields that were planted during the seventh year, months before the first rain, sprouted only small and weak crops. At the same time, our fields, sowed with the old infested seed and long after the appropriate season, were covered with an unusually large and healthy yield of wheat, in comparison to any standard. The story of “the miracle at Komemiyut” spread quickly. Farmers from all the agricultural settlements in the region came to see with their own eyes what they could not believe when they heard the rumors about it. When the farmers from Kibbutz Gat arrived, they pulled a surprise on us. After absorbing the sight of the bountiful quantity of wheat flourishing in our fields, they announced they wanted payment for the tractor-load of old rotten wheat they had scornfully given us for free only a short time before. Even more startling: they said they would file a claim against us at a beit din, a rabbinical court, and with Rabbi Mendelson himself, no less! They must have figured that in a secular court, such a claim wouldn’t have even the slightest possible chance of gaining them a single penny. Rabbi Mendelson accepted their case seriously, and in the end judged that we should pay them. He explained that the reason they gave it for free was because they thought it worthless for planting, while in truth it really was excellent for that purpose. We were astonished to hear his ruling, but needless to say, we complied. Six years you shall sow your field, and six years you shall prune your vineyard, and gather in its fruit. But in the seventh year shall be a Sabbath of solemn rest for the land, a Sabbath for G‑d . . . If you shall say: “What shall we eat in the seventh year? Behold, we shall not sow, nor gather in our produce!” I will command My blessing upon you . . .
Today, Komemiyut is world-famous for its high-quality shmurah matzah (lit. “matzah that has been watched”)—round, handmade matzah prepared under exacting supervision from the time the wheat is harvested through the end of the baking to guard against the minutest moisture. Translated-adapted by Yerachmiel Tilles from the Hebrew weekly Sichat HaShavua. Rabbi Tilles is co-founder of Ascent of Safed, and editor of Ascent Quarterly and the Ascent and Kabbalah Online websites. The Sabbatical Year basics: absolution of loans, desisting from all field work, and the spiritual objective of all the above. When is the next Sabbatical year? Can I collect debts after a Shemittah year? First article This is the first article i have read for the last seven years since from the shmita 7 years ago' I could not have found a more beautiful passage in our history,present and future to read. shmurah matzah Wow, what an amazing and inspiring story. For those of us with little faith, this is such an encouragement.